Thus a shear in the X direction produces y':=y (unchanged) and x':=x+αy. Doing a rotation by performing three shear operations might be advantageous, because it's easy to do a shear operation. To do a shear operation on a raster image (that is to say, a bitmap), we just shift all the pixels in a given row (column) by an easy-to-calculate displacement. 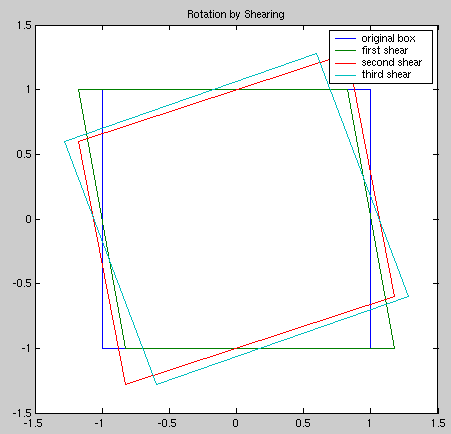 But in order to do a rotation using shears, we'll have to be able to calculate the necessary values of α, β, and γ from the rotation angle Θ. Thus we have α=γ=-tan(Θ/2) and β = sin(Θ). You can just replace the pixmult function with multiplication in most cases; its function is just to weight the given pixel value for the "skewf" fraction. The array to be sheared is given as the variable P, and shear is the shear factor (i.e. α, β, or γ). To make this useful you'll have to incorporate a change-of-origin to the center of rotation, and a suitable displacement to deal with negative indicies.